Wanting to go camping but worried about how comfortable camping sleeping will be? No worries, I got you covered! 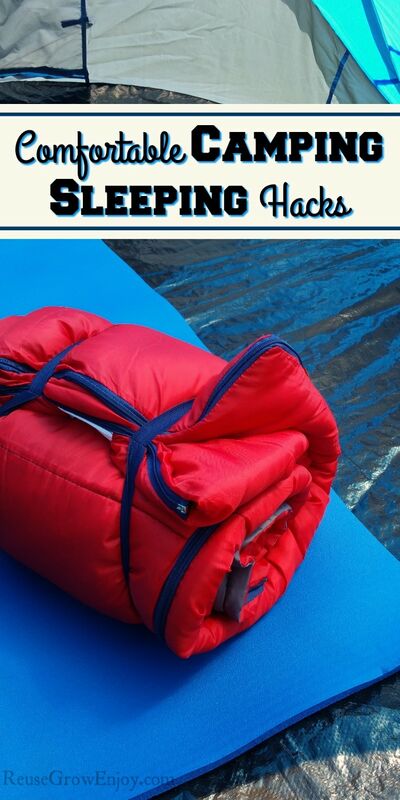 After you have learned a few of these camping sleeping hacks, you will be camping all the time! Comfortable sleeping is always one of the most important things of any trip. Whether that be at a friends house, hotel or if you are going camping. If you don’t get good sleep, it just makes for a miserable trip. 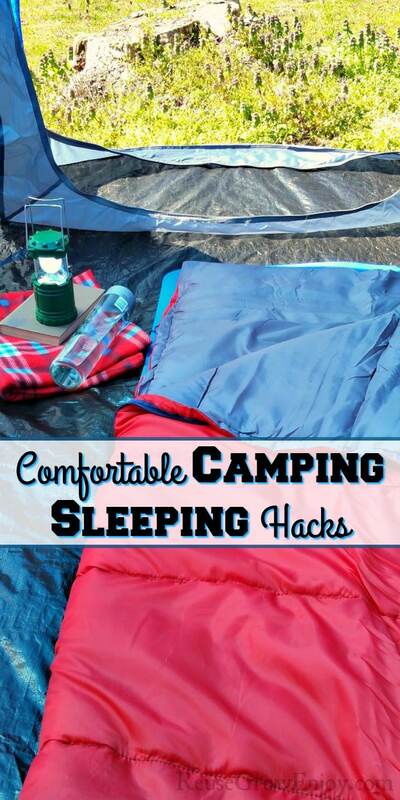 I am going to share a few comfortable camping sleeping hacks you should learn before you go. Camping mats are not the easiest to get out off. I know I for one have a really hard time getting up off the ground the older I get. If you can, opt to place one on a standard cot to get you up off of the ground. This is a great way to sleep comfortably keep warm if the ground is cold, and make getting out of bed easier for bodies that deal with aches and pains. Another great option for comfortable camping sleeping is one of those raised air beds. The prices of these have really dropped from when they first came out. They come in a variety of sizes too like twin – king. If a cot or raised air mattress is just not in your camping budget mats or normal air mattresses are better then the ground. 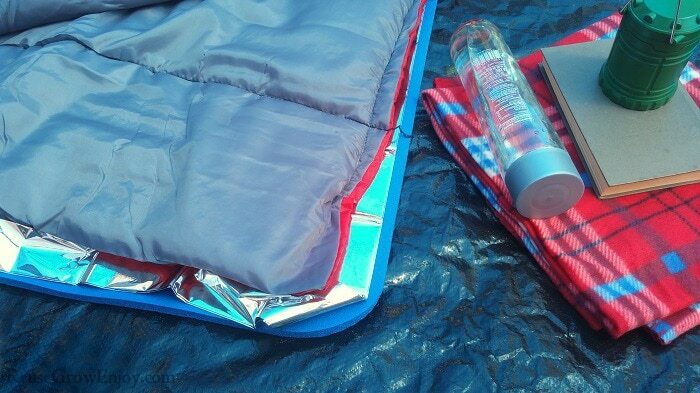 You can get a camping mat or even a thick yoga mat to add a little extra padding between you and the ground. This helps to pad those lumps and bumps on the ground. A single layer air mattress is also pretty comfortable and a lot cheaper than the raised ones. If needing a really low price option for kids, a blow-up pool raft works just as well. If you go camping in the winter you can help keep comfortable and warm by putting an emergency blanket between your sleeping bag and sleeping mat. This will add another layer between you and the cold ground to help keep your warm and comfortable. The reason I say use an emergency blanket and not just another normal blanket is because they help to reflect your body heat back to you. A normal blanket just allows the body heat to escape into the air. 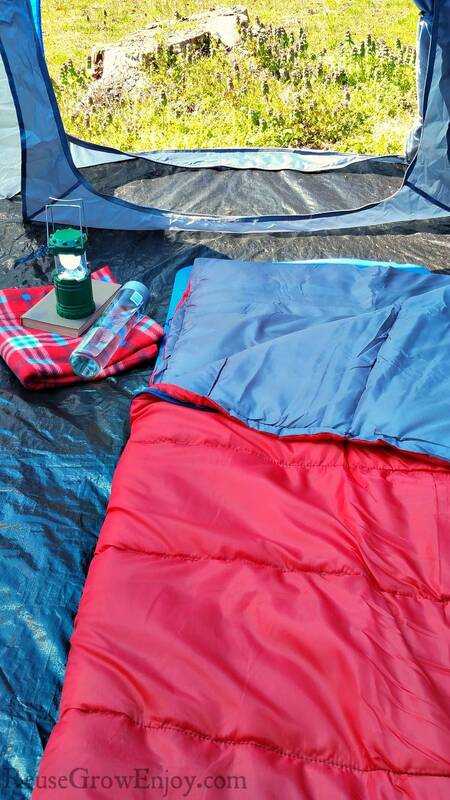 In the warmer camping months, you can do several things to help keep you cool at night. A rechargeable fan is a great investment for keeping your tent cool. I like the rechargeable ones so you don’t burn through batteries like crazy. They are also nice to have when the power is out. If you will be somewhere without power to recharge them, think about getting a small portable solar panel. Plus by having a fan it helps to add a little white noise. That way you don’t wake up from every little sound you hear. I am someone who sleeps with a fan all year long even at home. If you stay on campsites with power, one of the best things for camping in the summer is to use a portable air conditioner to make your tent cool and comfortable anywhere you are. Protect yourself from mosquitoes and other pests. Look for options that can be used all night so you can sleep well and wake up without bites in the morning. Make sure there are no holes in your tent that would allow insects in. Use essential oils around your tent to protect you at night while you sleep. Nothing worse than laying down or waking up to a damp bed. Staying dry while sleeping is vital to staying comfortable all night long. Make sure your tent stays dry by using a tarp under your tent and a tarp or rain fly over your tent. Another great way to keep the tent dry is to treat it before you go with a water repellent. If you know you will be camping in a really wet and rainy time, you may also want to think about a tent over your tent. Sounds crazy, right? Some sites just do not have trees that you can use to tie a tarp too, making it hard to put that extra shield above your tent. But you can also use those pop-up canopy tents over your camping tent. This is only normally needed in really wet and heavy rain times. Just be sure to pack some extra clothing and a blanket or two in a dry bag on the off chance things do get wet. Hard to think that the size of the tent can play a huge role in comfortable camping sleeping but it can. When camping in cooler temperatures, it is nice to have a smaller tent. That is because the smaller the tent the easier it is to warm with body heat. Plus it allows you to be closer together to keep warm. However, if you are camping when it will be warm or downright hot out, the last thing you want is to have someone pressed right next to you. You want to have a little breathing room to allow for air flow. That is when it is handy to have a little larger tent. When you pair a larger tent with something like a rechargeable fan you will be much more comfortable on those warm nights. If having two tents is not an option for you, consider a compromise and get something that is mid-size. That way it will work for all seasons. Looking for more tips on camping? Here are some other helpful posts to check out.